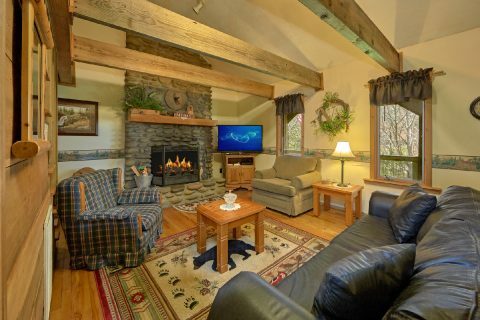 Ready for a truly relaxing getaway in the Smoky Mountains of Tennessee? 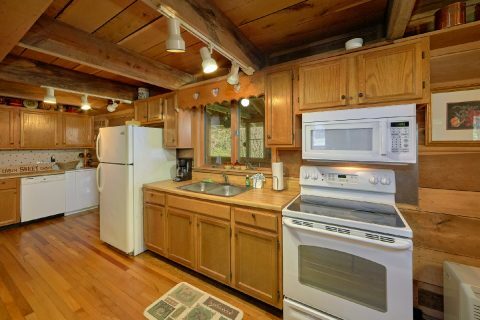 Come experience "River House" an affordable 2 bedroom cabin rental with a beautiful location right on the river! 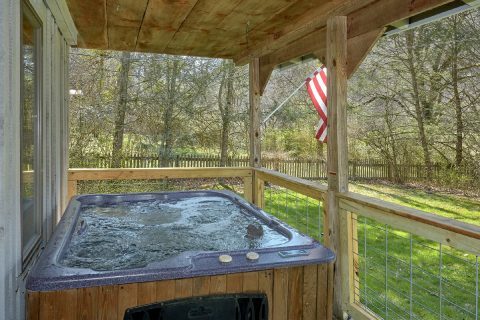 Not only is this cabin rental the perfect place to relax while you listen to the sounds of moving water, but it's also only a short drive from exciting attractions in Pigeon Forge and Gatlinburg, TN! 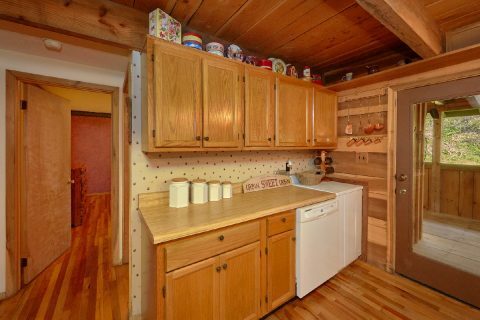 Whether you plan on visiting Dollywood Theme Park or hiking in the Great Smoky Mountains National Park, this cabin is only a short trip away! 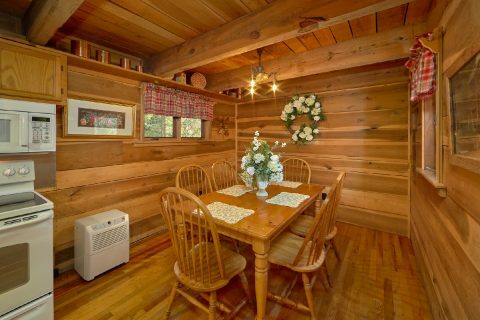 Back at this peaceful cabin in the Smokies in the Richardson Cove area, you'll find everything you need to relax in comfort and style. 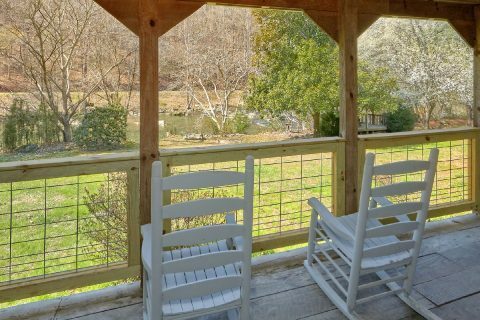 This cabin's front deck features a river view, rocking chairs, and a hot tub to enjoy during your stay. In the spacious front yard, you'll have plenty of room for outdoor activities like throwing the football. 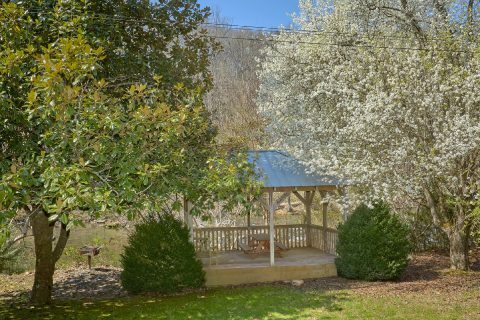 There's even a nice gazebo area right by the river, so you can enjoy the peaceful scenery up close. 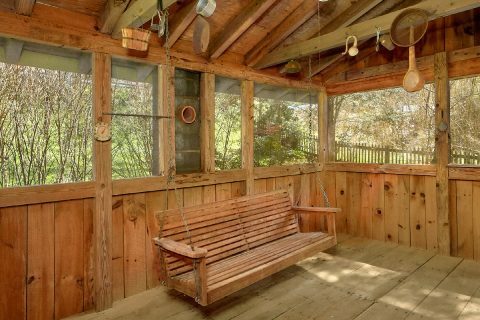 This cabin also provides a screened-in back deck so you can enjoy the fresh mountain air without being troubled by nature's pests! 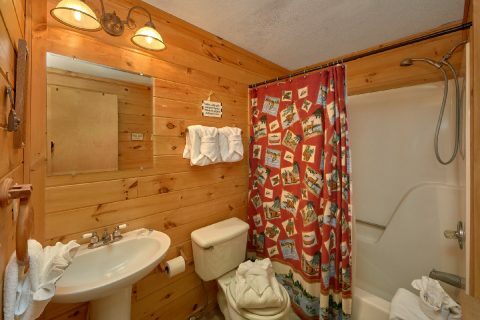 Additionally, this cabin provides guests with a concrete pad that allows easier access to the river. 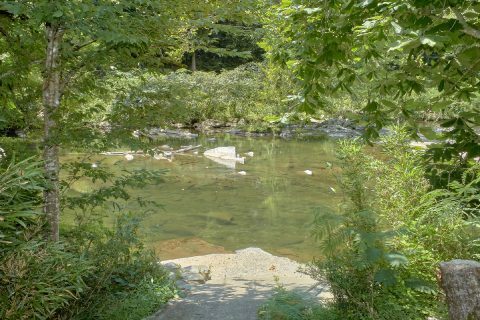 It's also a great place for fishing or swimming in the refreshing mountain water. 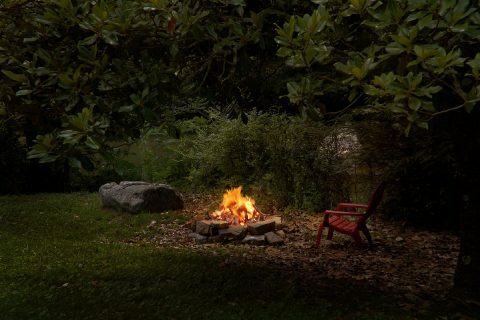 "River House" even boasts an outdoor fire pit, so you can enjoy a relaxing evening under a starry night's sky while you relax by the fireside. 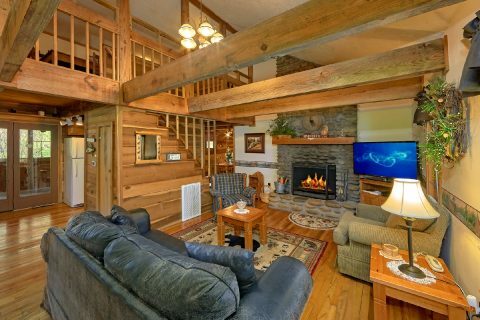 Inside this cozy cabin, the main living area with a wood burning fireplace and television is the perfect place to spend quality time with friends or family. 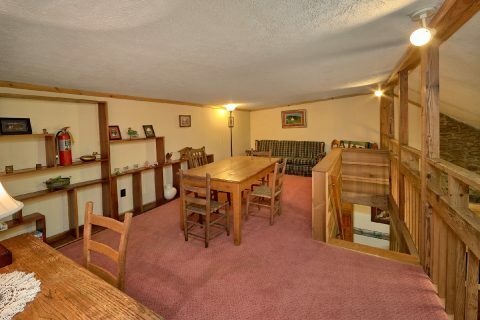 For some in-cabin entertainment, there's even a room with a pool table so you can enjoy some friendly competition during your stay. 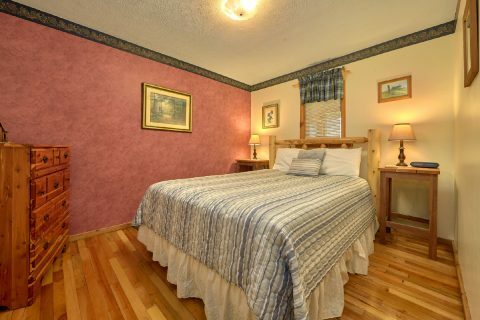 With 2 private bedrooms, "River House" can sleep up to 4 guests in comfort. 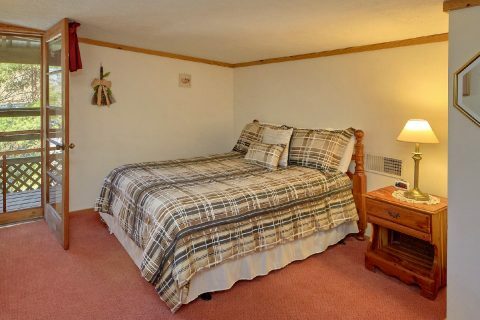 The main level features a bedroom with a queen bed, while the upper level is home to another bedroom with a queen bed and a private balcony. 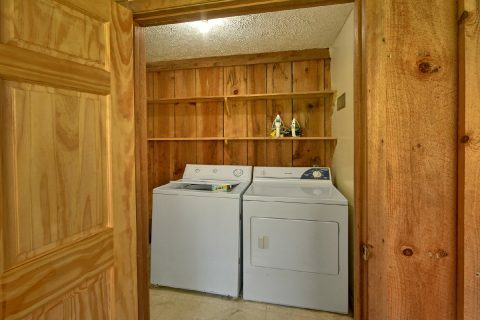 Lastly, "River House" comes with useful features like a fully equipped kitchen, a charcoal grill, and a washer & dryer to use during your Smoky Mountain vacation. 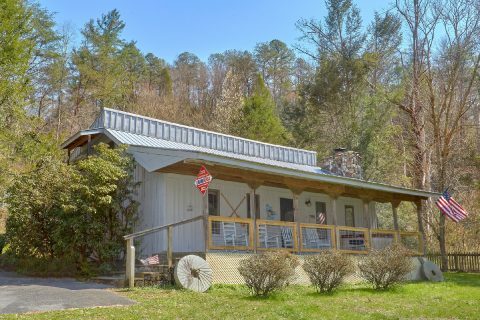 Book this affordable 2 bedroom cabin that's right on the river today with Cabins USA to save 15% on your nightly rate in the Great Smoky Mountains of Tennessee!